The brief for Project Run & Play(PR&P) this week was American Sportswear. But, I'm looking at the picture of Zoë in her outfit and wondering if we have ended up with more of a French thing going on....?! 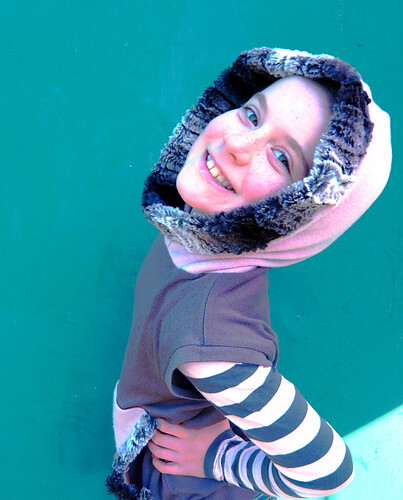 Zoë and I initially read "sportswear" and she was keen on lycra with sports shoes and gymnastic poses... but when we checked the definition of American Sportswear on Wikipedia we found it was something quite different, but could cover a huge range of looks. Slightly baffled, we Googled for images to give us some ideas. Since Zoë has to actually wear these clothes (PR&P is a great excuse to fill her drawers this spring) I was after something practical as well as fun. The sailor-inspired styles from the 1930's caught my eye. It was a start. So, I rifled though my stash and found some stripy lightweight muslin inherited from my mum, and some soft jersey knit in red (left over from the Jubilee Outfit) and white. Sailor-ish. The shorts came first. 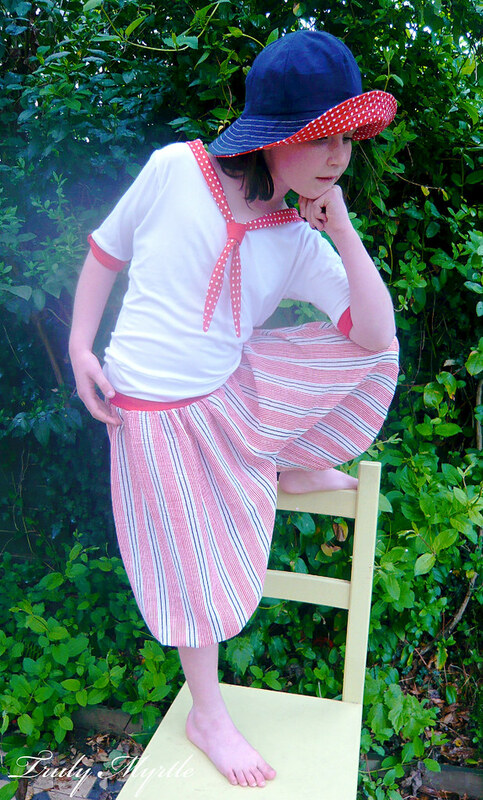 I was keen on culottes but Zoë had other ideas, so we whipped them in under the knees with a band of red jersey and called them harem pants. 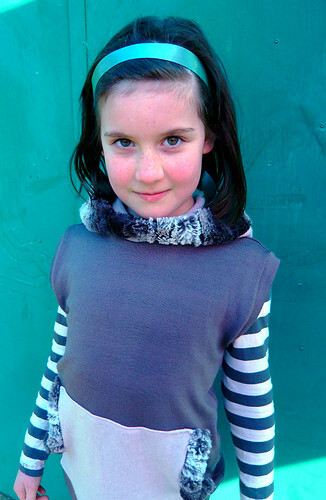 They've got a comfy jersey knit waistband (our favourite kind!) which folds over double for a snazzy look. The pants themselves are very full with a low crotch. Roomy and lightweight; perfect for hot days and great for racing around. The top is my favourite piece. 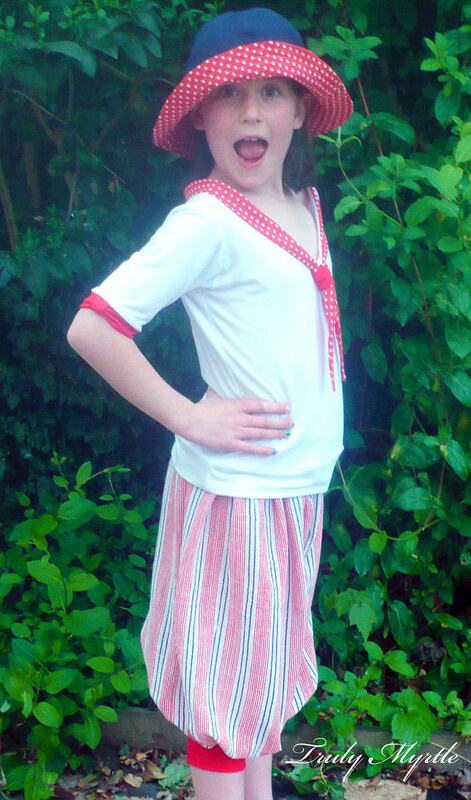 White jersey knit, with a red jersey and dotty crisp cotton trim. 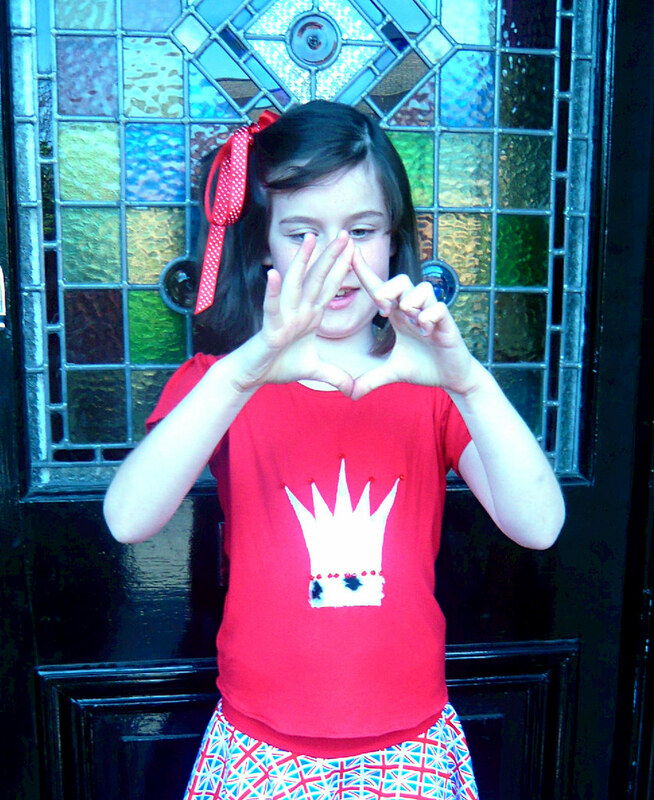 I cut around another of Zoë's t-shirts to get the right size and shape (much like I did for the hoodies). The overlocker (serger) made quick work of sewing it up, but the real fun was in the details. The sleeve cuff is prettily gathered up with a nifty little band. Do you see? It ends up looking a bit like a bow and it just lifts an otherwise boring sleeve. I did the neck twice... I wasn't going to - but something wouldn't let me leave it alone. So it ended up a little big. But she'll grow! The first neck band was red jersey knit but it just didn't sit right. It kept riding up at the back and quite frankly, looked yuck. So, I took it off and had another go with the dots. 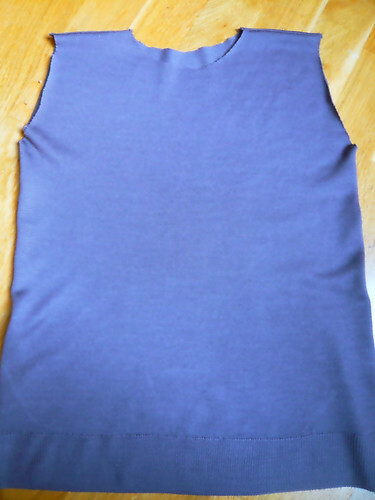 This time I slightly stretched the neck of the T-shirt as I sewed the collar on. Once it was flipped over, the collar sat much flatter. I was disappointed that the knot at the front didn't fall as well as the jersey knit but remedied this by making a wee jersey toggle. And, lastly, the hat. That wee freckly nose needs to be covered. 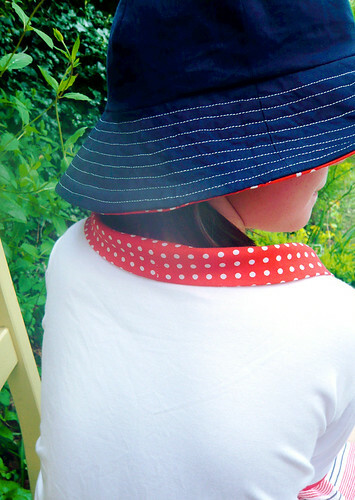 This hat is reversible; french navy on one side and red and white dots on the other. I've topped stitched it in white. Super cute. 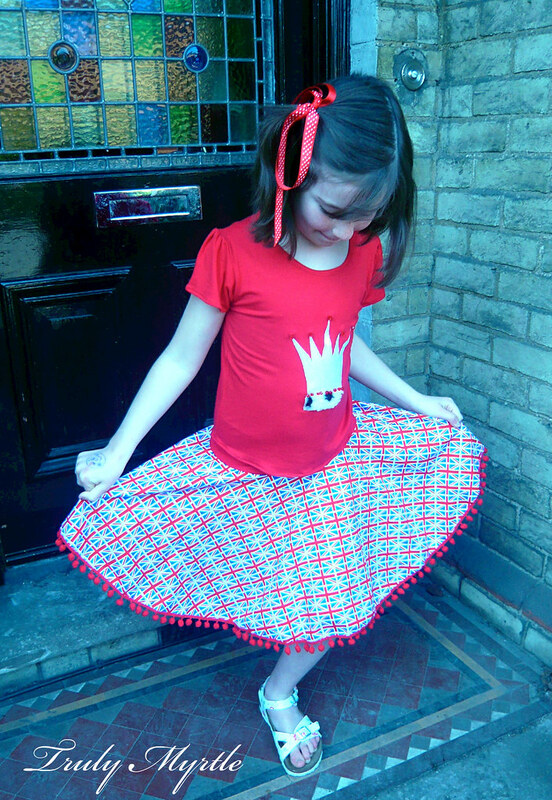 It's based on a pattern in the sweet book making children's clothes by Emma Hardy. 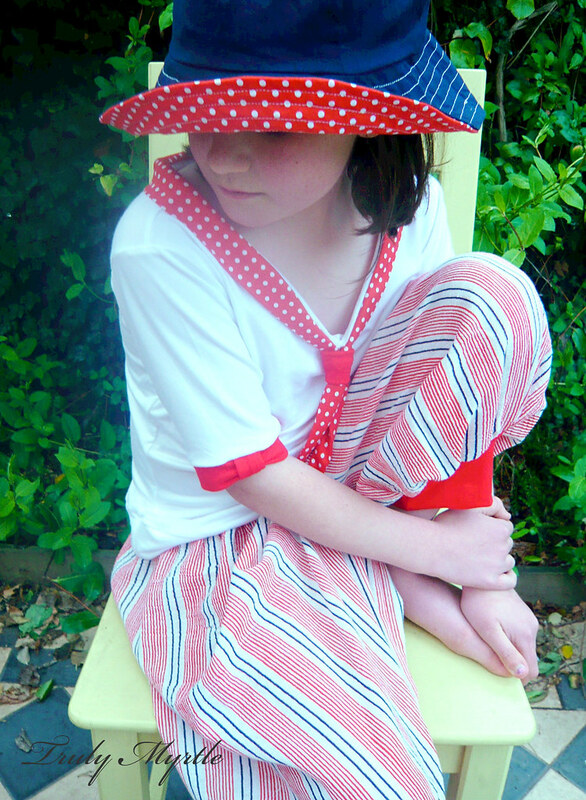 It's a lovely book, the clothing is practical and fun. The patterns are brilliant for a novice sewer, but even a seasoned seamstress will be inspired by the pretty fabrics and fun details. The patterns in the book are only for sizes 0 - 5, so for Zoë's hat I cut the pieces a little bit bigger, and away I went. 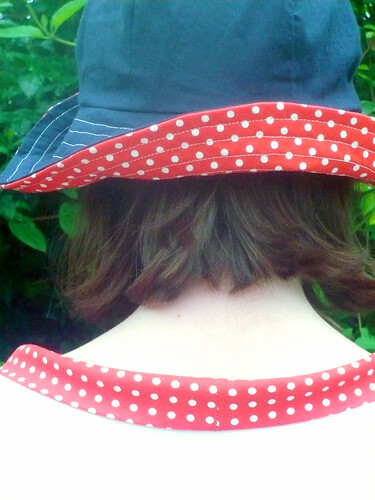 The hat whipped up in no time and with no exposed seams it looks very professional. Very satisfying. It was freezing when I took these pictures! We had to click super fast. American Sportswear - Truly Myrtle style! 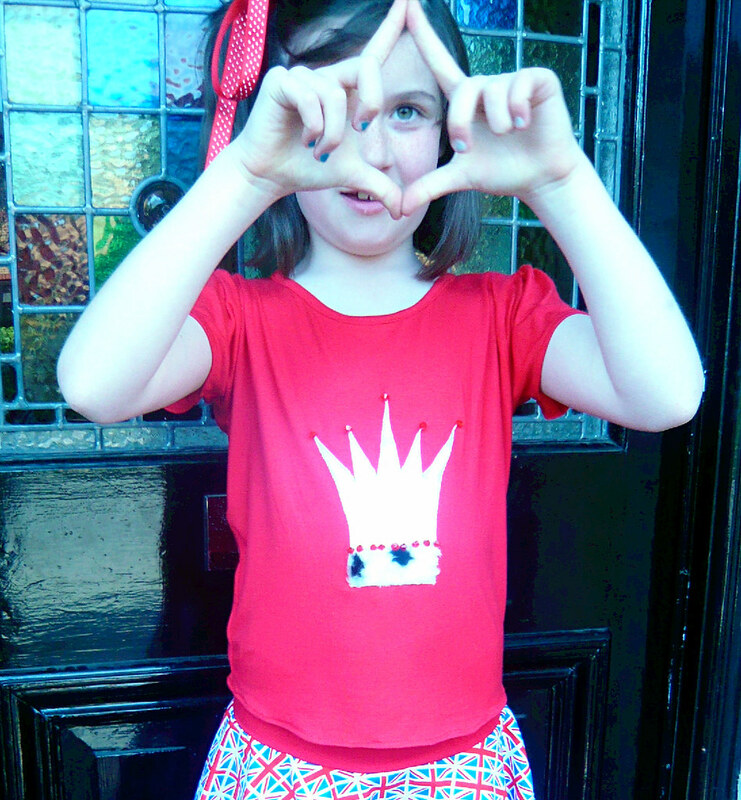 We've been getting ready to have a bit of Jubilee fun. 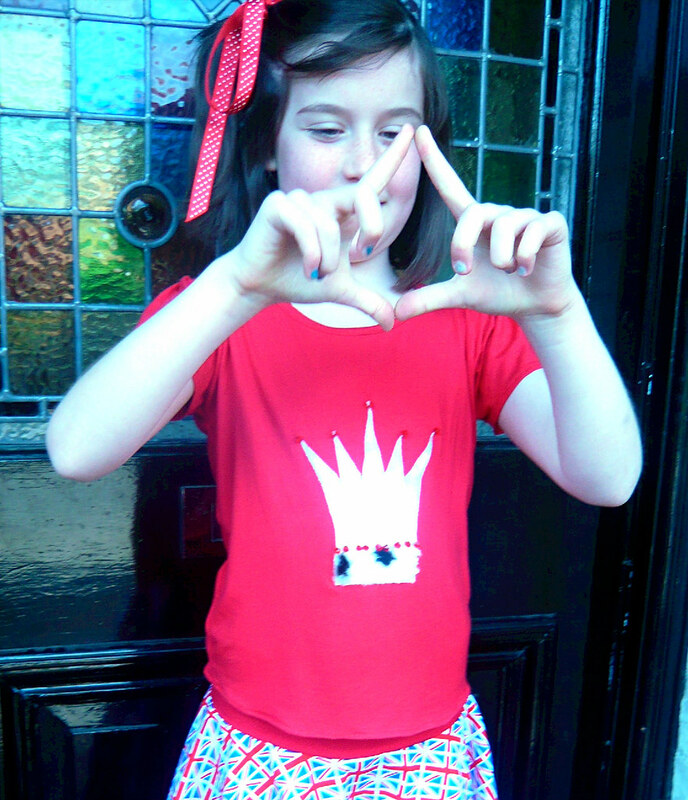 It's the Queen's Diamond Jubilee this year. Here in the UK we celebrate with a FOUR day holiday weekend in June. Yippee! As well as spectacular official events, I'm sure there will be street parties, bunting, flags and much revelry. And, although we aren't really Royal Fanatics at Truly Myrtle, we do love a bit of pomp and the odd curtsey. 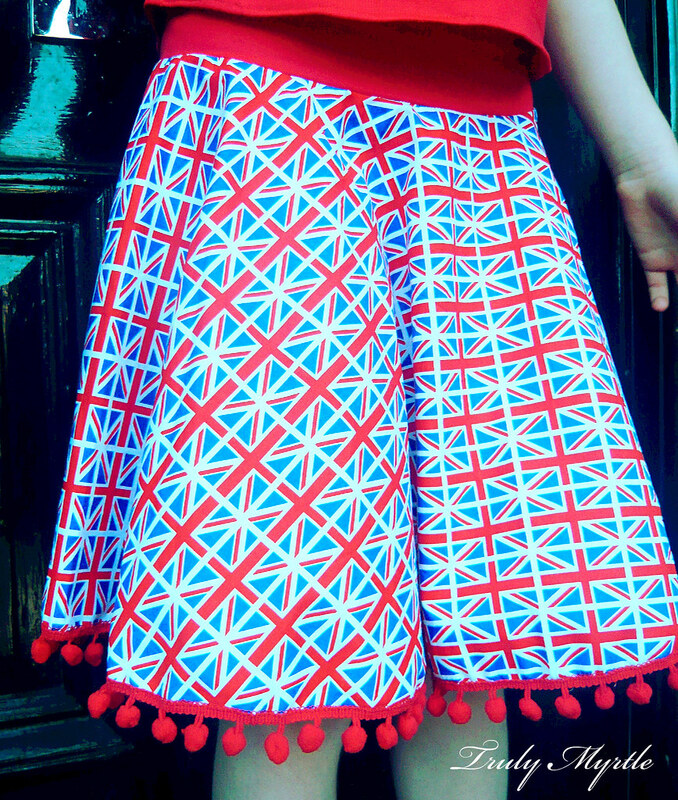 This Union Jack circle skirt with its soft knit waistband and bobble trim is just what you need for a proper Royal celebration, don't you agree? 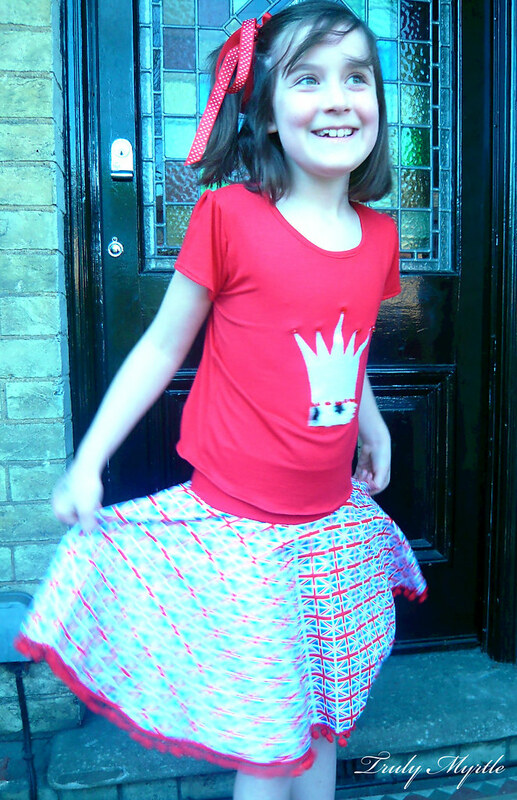 And, when your new skirt is teamed with a new T-shirt, complete with a shiny crown, jewels, a bit of regal fur and puffy sleeves, you just have to twirl! But, guess what? It's a double celebration! Project Run & Play has started again! Do you remember the fun I had last time?! 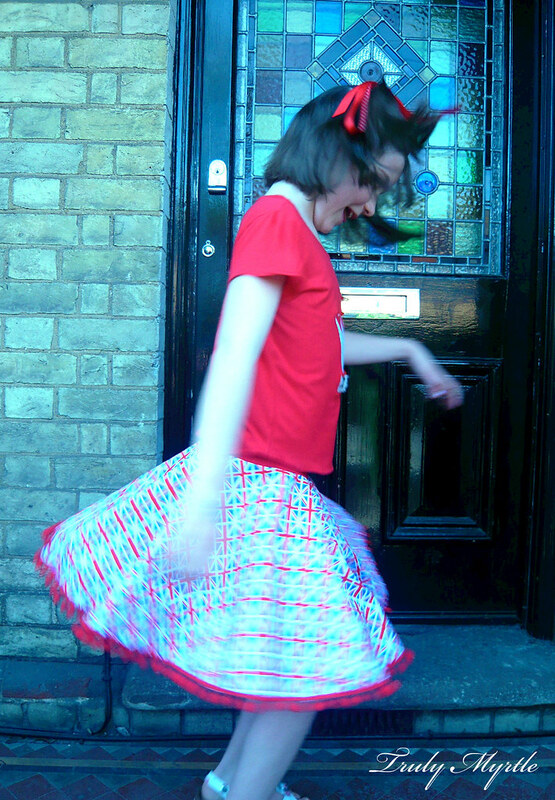 The new competition has kicked off with a circle skirt theme based on this fab tutorial. 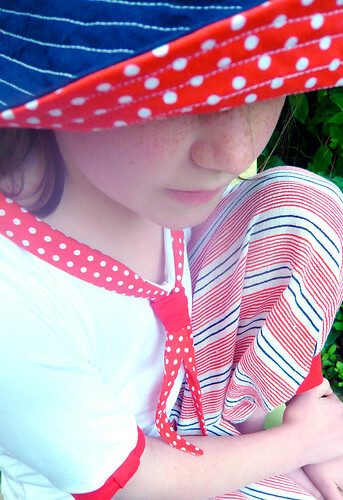 I thought I'd let the fantastic flag fabric do the talking, so adapted the original pattern only a little. 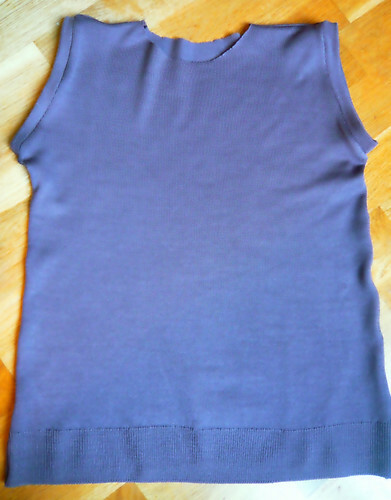 Instead of the elastic waist I used jersey knit (the same fabric I used for the T-shirt) for a soft, slightly dropped, double fabric waistband. More comfy. That's important for my girl! I've cast on my new top for the knit along. 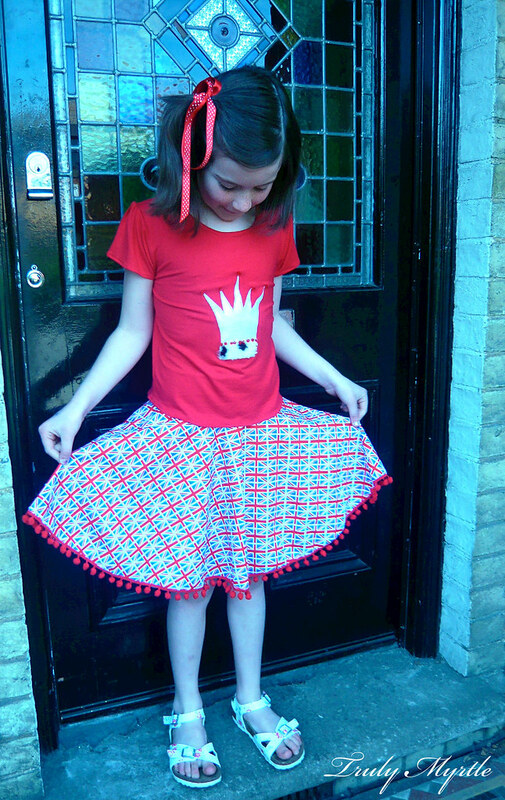 It's been featured on CraftOManic!!! today! Wow!!! I am so excited!!! Thanks heaps for having me Jen! 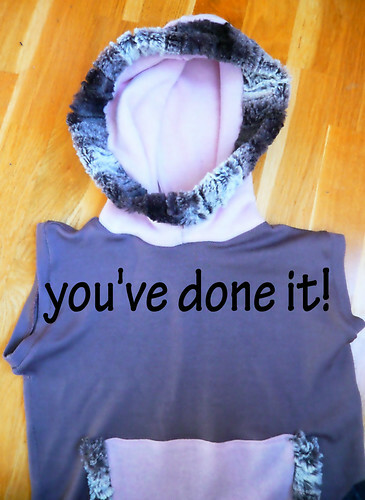 It was fantastic to make it to the final five in the Project Run & Play sew-along signature competition, and I am really excited to share my hoodie tutorial, so that you can make one too! 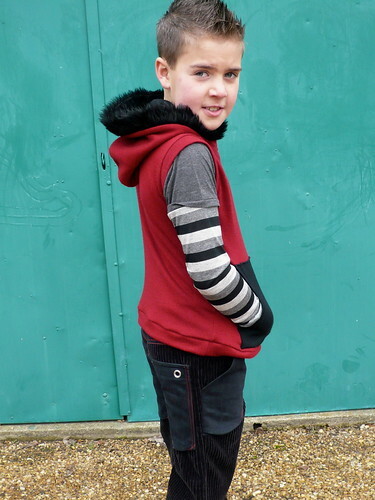 You'll see in the photos that I've have made two hoodies and they are slightly different. 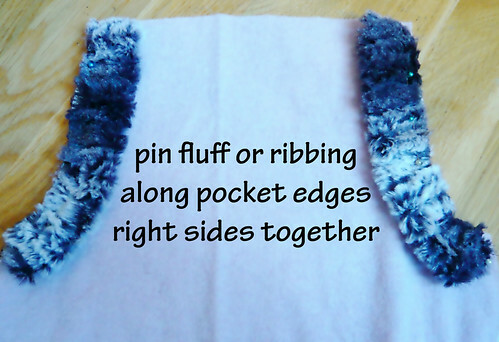 This pattern is very versatile, use your imagination! 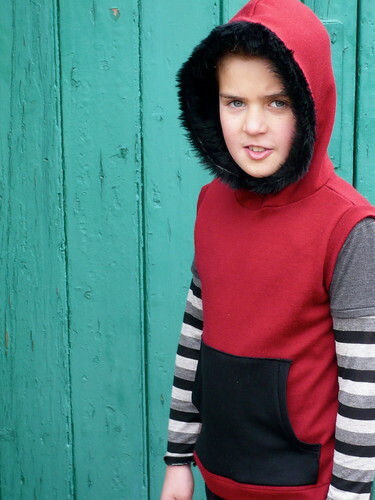 the red hoodie has two colours on the hood, slightly cut-away sleeves and ribbing around the pocket edges. 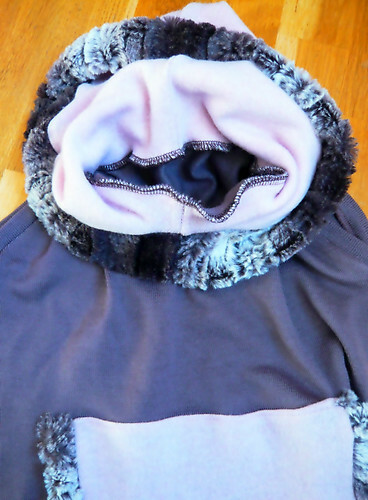 The grey/pink hoodie has fluffy cuffs on the pocket, the sleeves are wider and the lining and outer fabric of the hood are the same colour. 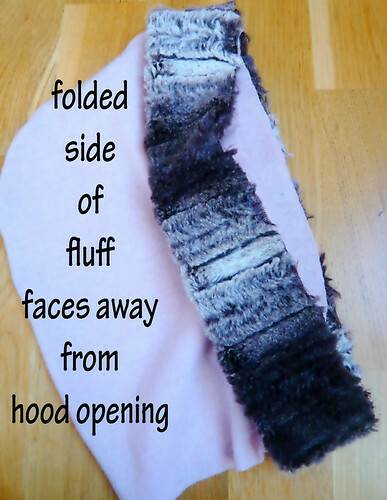 You could mix and match your fabrics and leave off the fluffy edge to the hood if you want. It is up to you (or the kid you are sewing for!!!). 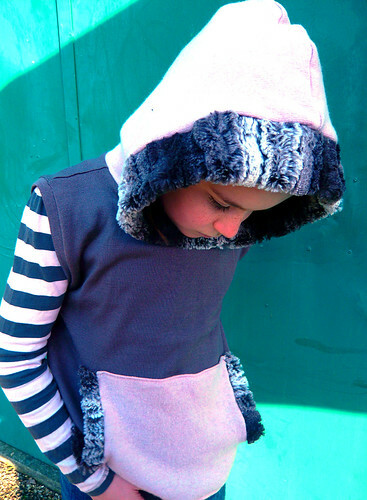 You won't need a pattern, just a top that fits the person you are making the hoodie for and a hood that you like the shape of, which also fits. The hoodie is fairly close fitting, so choose a top that fits fairly slimly. But, If you really want a baggy body then feel free to go with that! Or, enough jersey knit to fit a couple of sweaters laid out. I like these merino sweaters because they are light-weight and warm. 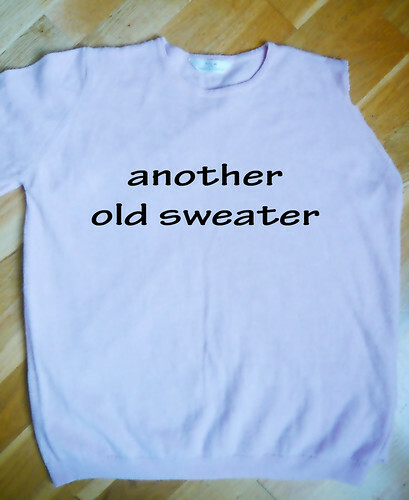 And, as I up-cycle old sweaters rather a lot I've already chopped into mine! If you have two whole sweaters you'll have more options and if you want to use more than two colours, grab more sweaters. 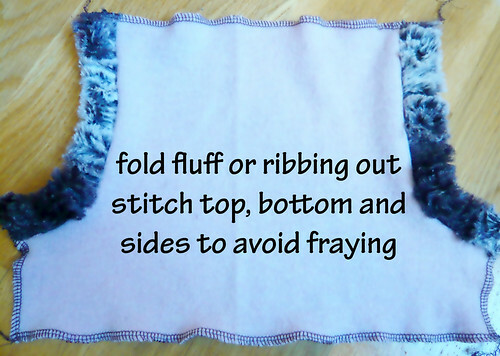 You'll also need a length of fluffy fabric if you plan using that. 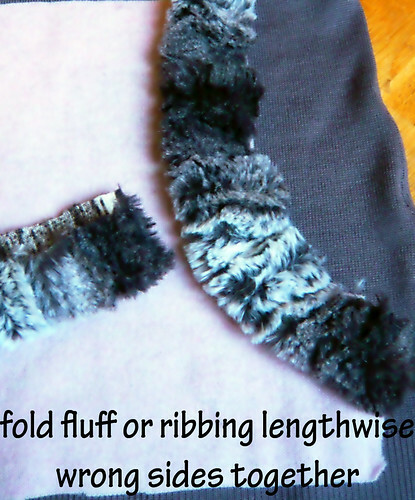 About 10cm (4") wide and long enough to stretch around your face, more if you want to edge the pockets with fluff too. Obviously you'll need a sewing machine, scissors, pins, thread, chalk and a tape measure. 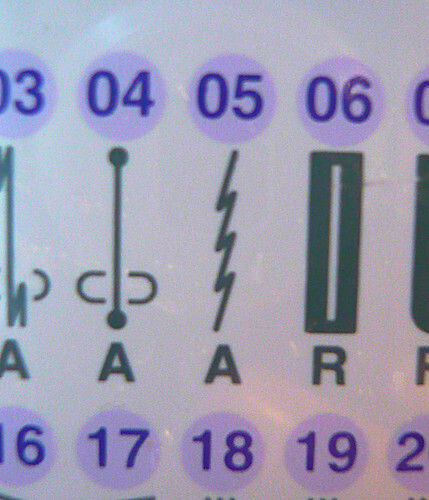 An overlocker (serger) makes life easier, but it isn't essential. 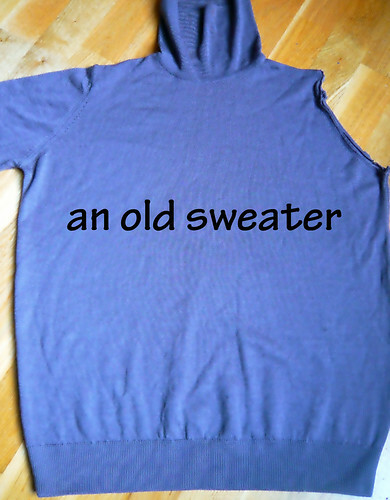 Lie your top (sleeves folded in) on to your sweater and cut around it. You'll have two pieces, the same size. 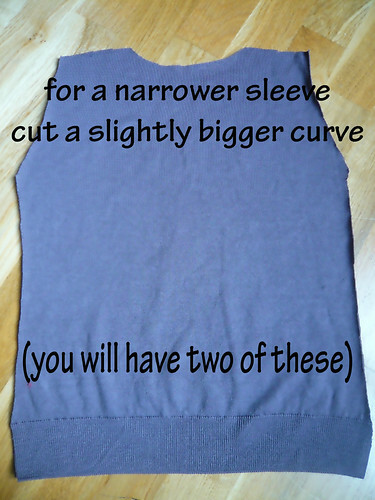 Now is the time to make any adjustments to the sleeves. 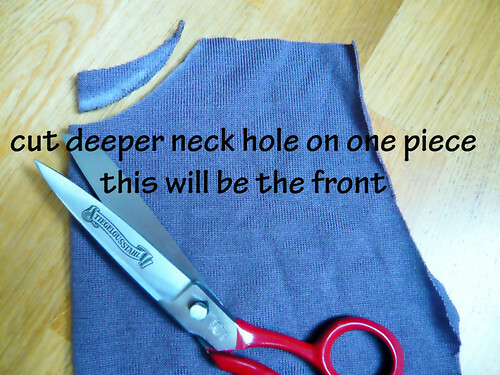 Next, even up the neck hole on one piece and cut the other a little deeper. 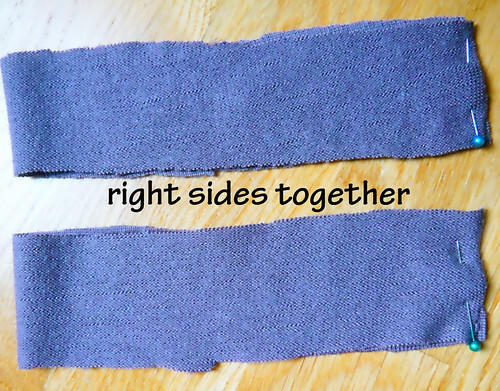 Do you want matching ribbing on the sleeves or contrasting? I matched mine but contrasting could look very cool. 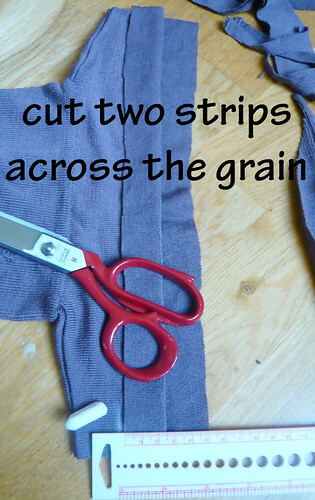 Cut two strips across the grain (side to side on your sweater) 5cm (2") wide and long enough to reach around the armhole when slightly stretched. Back to the body pieces. Lay them one on top of the other, right sides together. 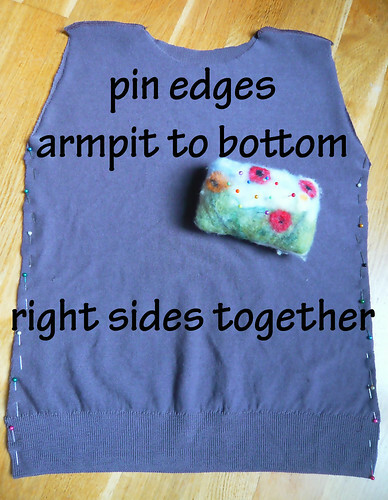 Pin the shoulders and sew them together. If you have an overlocker, great! 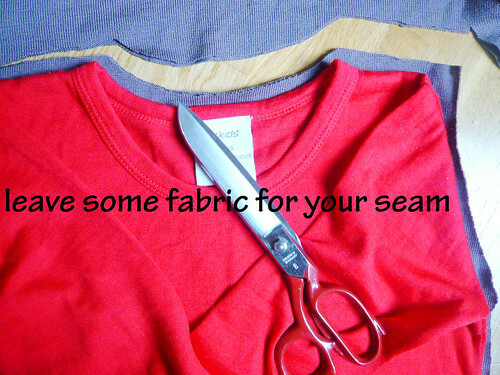 If not, use a stretch stitch or a zig zag stitch for your seams. My stretch stitch looks like 5 below. Some of you will know that a sewer's magic weapon is their iron! 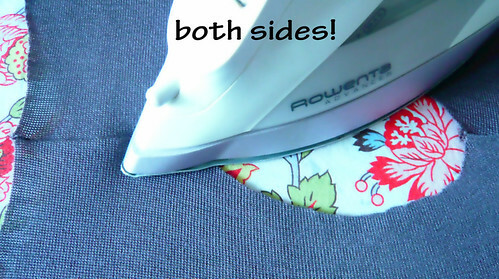 Ironing all your seams flat as you sew them will make your garments look great. So, turn on your iron! Turn the body inside out, right sides together. 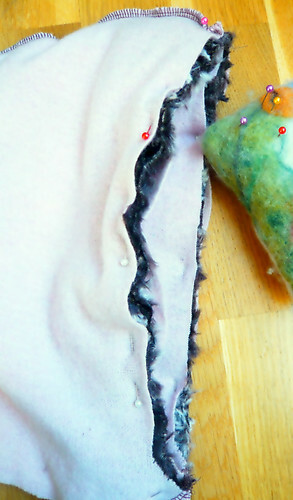 Pin and sew the side seams, from the bottom of the armhole, right down the side. 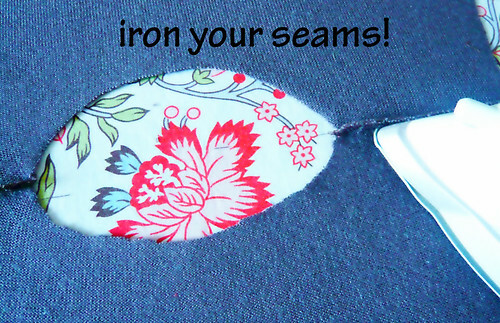 Then, iron those seams! 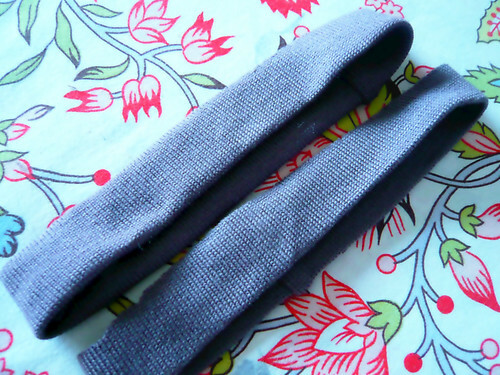 Grab those long strips you've cut for the armhole ribbing. 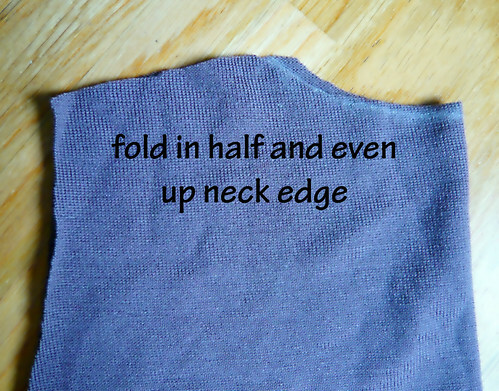 Fold them end to end, right sides together. Pin and stitch. 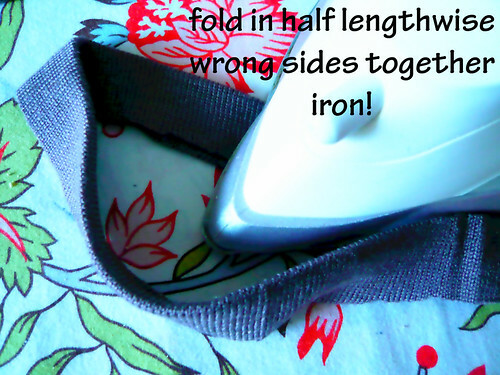 Turn and fold lengthwise, wrong sides together. Iron the fold. 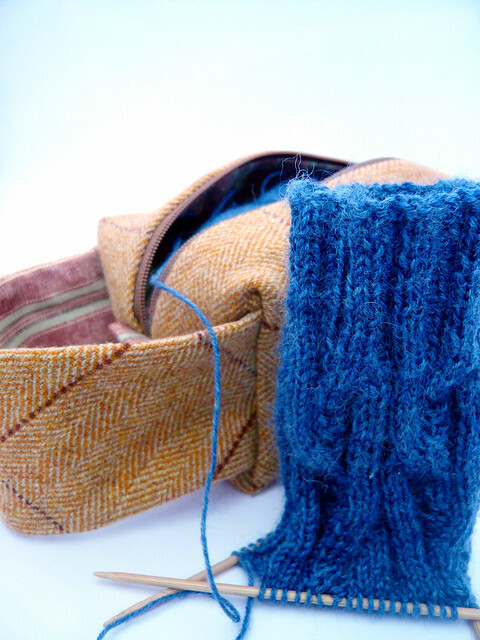 With the body inside out, ease the ribbing around the edges of the armhole. Right sides together and raw edges together, pin in place. 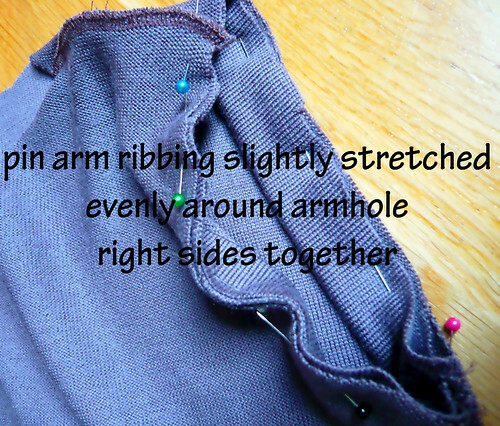 I find it easier to stretch the ribbing around the inside of the armhole, rather than around the outside. 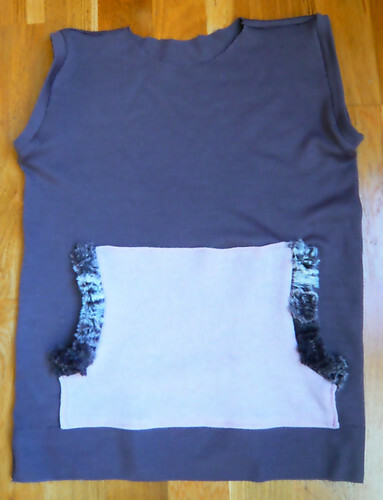 Cut a pocket shape from one of the remaining sweaters. 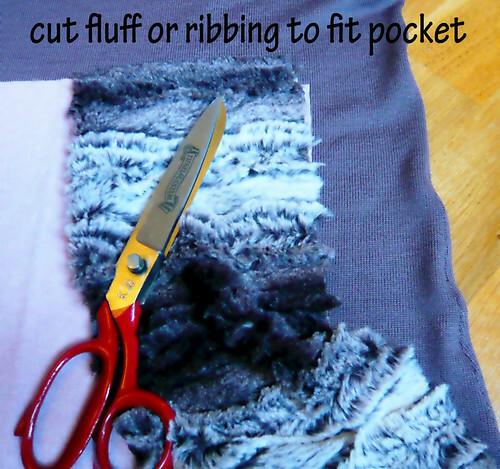 Cut some fluff or a strip of sweater cut across the grain (side to side) about 7.5cm (3") wide, the length of the pocket openings. 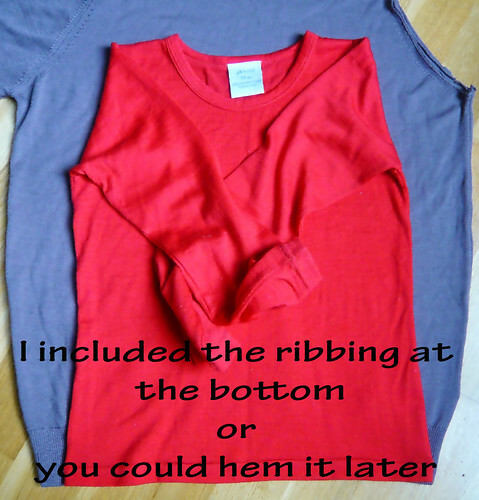 Fold the edging in half (like for the armhole ribbing above) and pin the raw edges to the pocket opening. Sew. 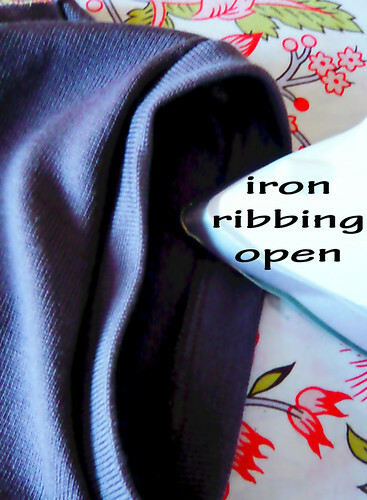 Open out the ribbing, or fluff, and iron flat. 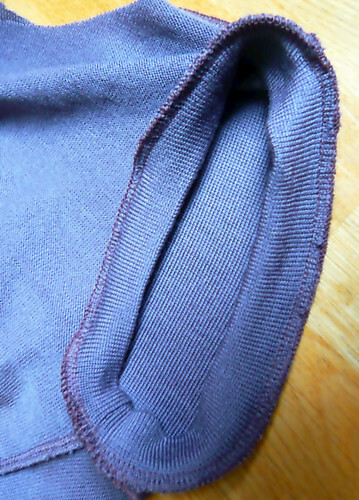 Overlock or zig zag along the raw edges at the top, sides and bottom of the pocket. 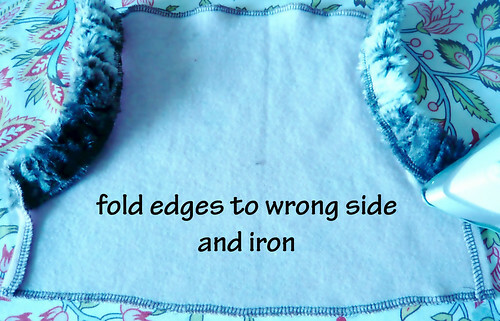 With the wrong side facing you, iron in a 1.5cm (1/2") fold at these edges. 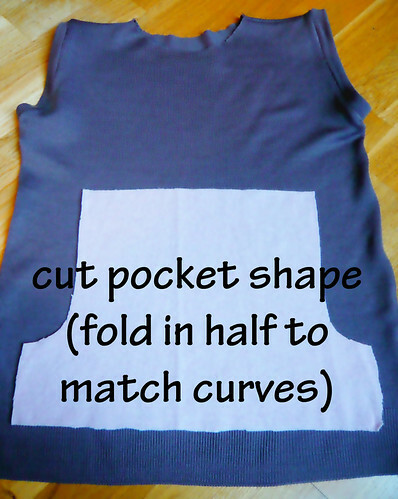 Carefully pin the pocket to the front of the body where you think it looks best. 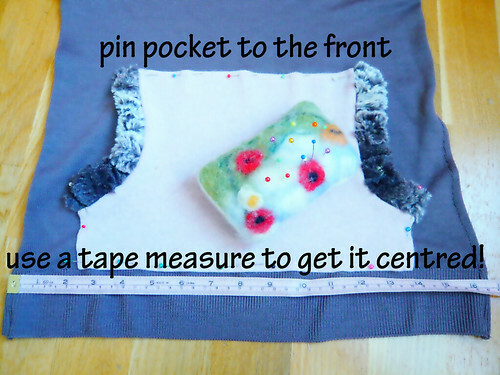 Use a tape measure to ensure that the pocket is exactly in the middle and an even distance from the bottom. If you are going to hem the bottom (like Gabe's), make sure there is enough fabric left to turn up. 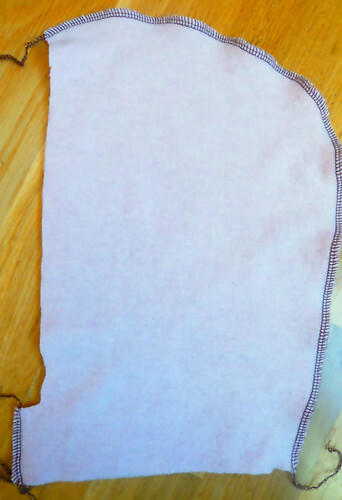 With a long straight stitch (I used a 2.6mm stitch) sew the pocket to the body at the top, sides and bottom. Take care to sew the pocket to the front of the body only!!! If you want to hem the body, do that now. 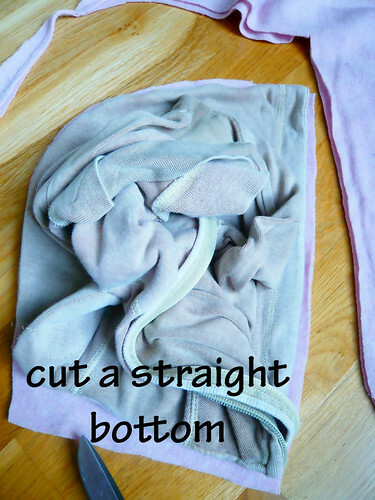 Turn up the bottom, iron and sew. 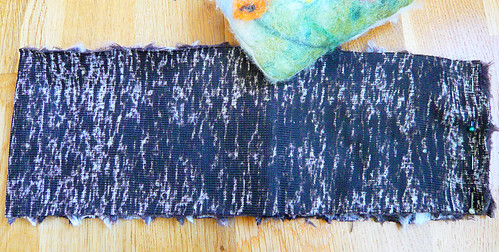 I quite like sewing a false band with my overlocker. 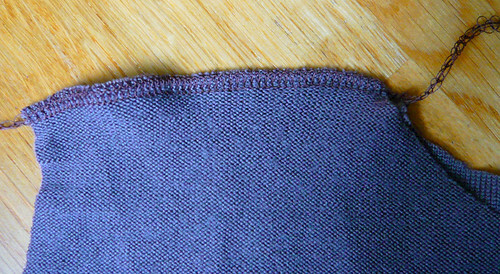 I turn the hem back on itself and then sew around the fold. 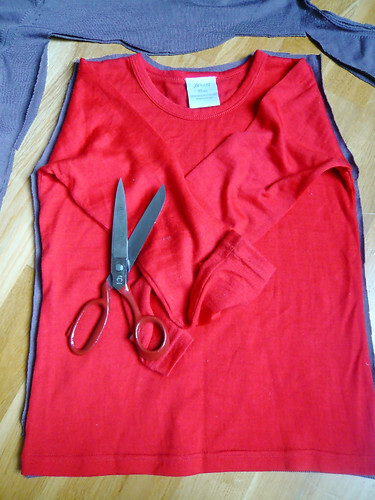 If you don't have an overlocker, don't forget to finish the edges with an overlocking stitch or zig zag, and use a stretch stitch. We're going to make the hood now. 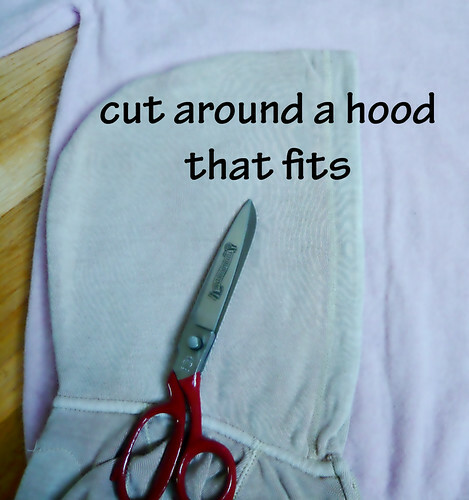 Lay a hood that fits, on top of your sweater, going with the grain (up and down the sweater). 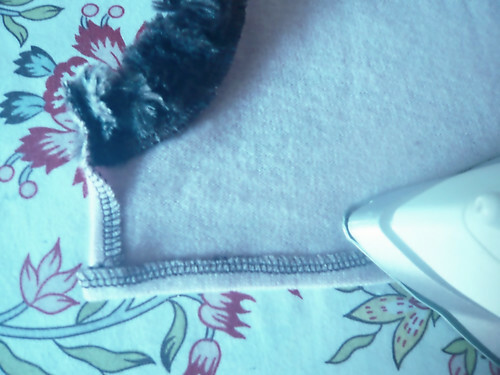 You'll do this twice, once for the outside of the hood and once for the lining. These could be the same or different, I've done one of each (the sleeves of one of your sweaters, cut open and ironed flat might be a good size for the hood pieces. Don't forget you need two layers). Cut out the hood, lifting it up to cut a straight bottom edge. Then, cut a strip off the front of all your hood pieces, leaving about 5cm (2") at the bottom. Curve the bottom of the cut-out. You should have four pieces cut out for your hood. They might be all the same colour (like the grey/pink hoodie) or two of each, in contrasting colours (like the red hoodie). 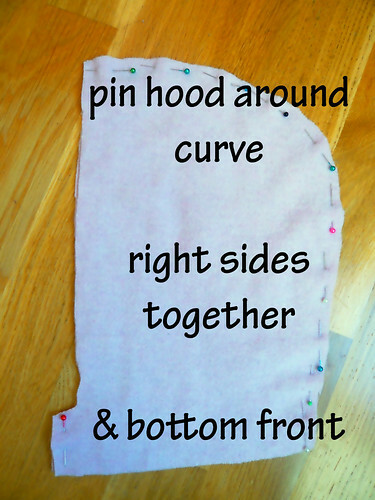 Pin and sew your hood pieces, right sides together, along the back curve and up the front at the bottom. Turn one hood inside out and the other the right way out. 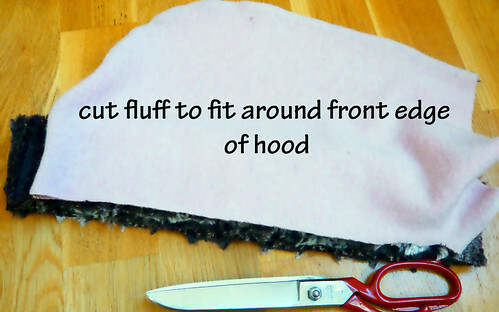 If you don't want fluff in the hood, leave the next step out. Carefully slide the wrong-side-out hood over the top of the other, so that the face openings match. Pin together the hood-fluff-hood sandwich. Sew. Phew!!! 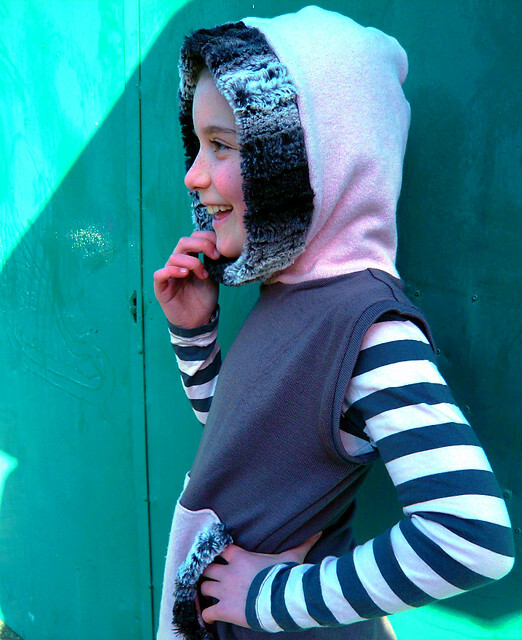 Turn the hood the right way round, through the neck hole. Wow!!! 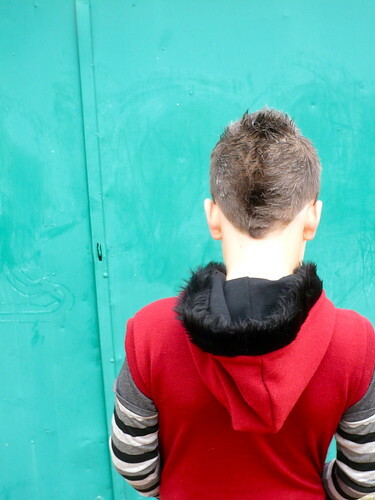 Look at that great fluffy edged hood!!! 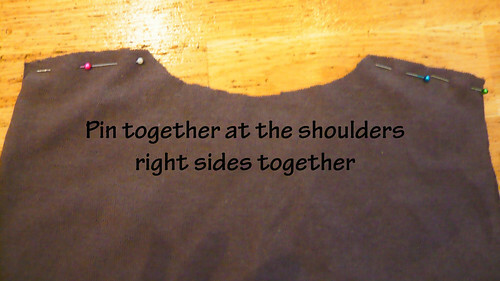 With right sides together, pin the hood neck (two layers don't forget) to the neck of the body. You might have to ease the neck evenly around the hood. 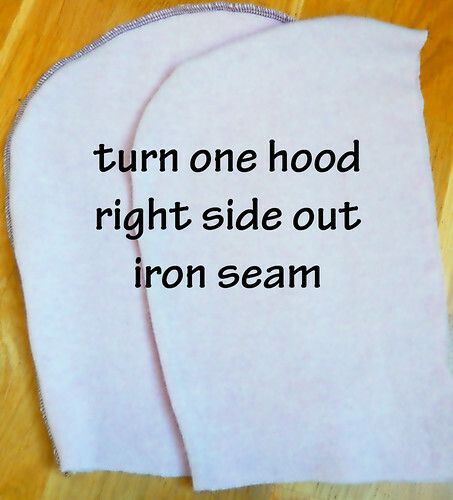 Sew the hood to the body. Take a look at the pictures below to see how I did it. 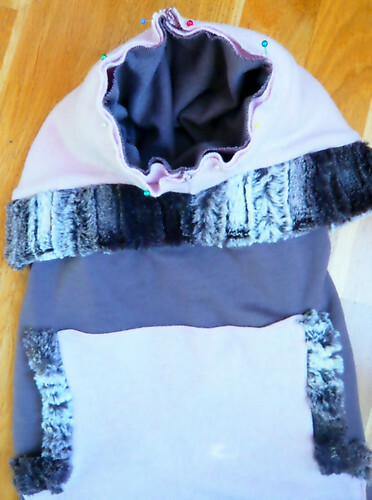 If you have a multi-coloured hood, make sure the inside colour is facing out. Pull your hood up and voilà!!! You're done!!! If you have any questions, please email me and I'll do my best to answer them. I'd also love to see pictures of your hoodies!!! If you'd like to follow my creative adventures and see what else I come up with, feel free to subscribe to Truly Myrtle or enter your email address on the right sidebar to receive updates by email. Thanks! 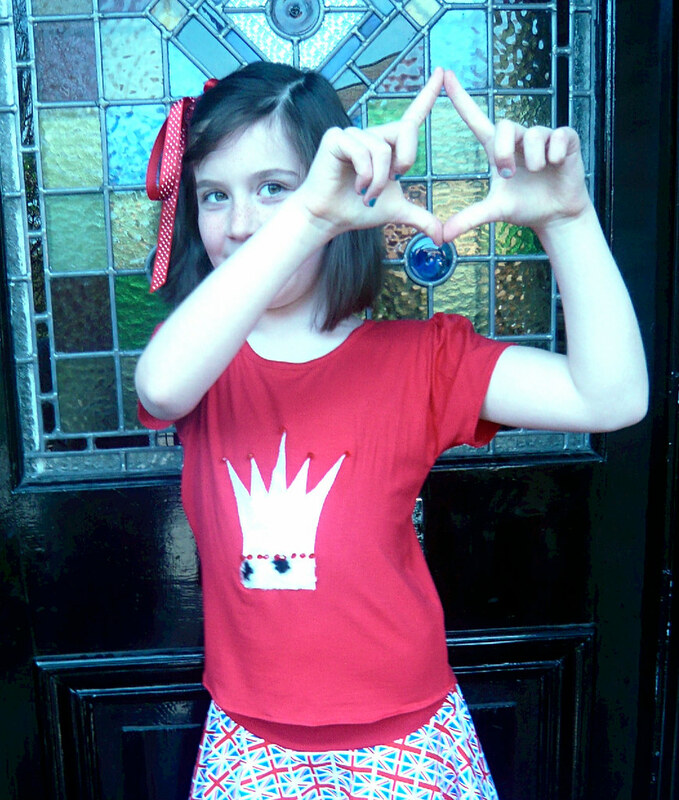 The results are out and I am either third, fourth or fifth in the project run & play sew-a-long signature outfit competition! Thank you, thank you, thank you everyone who voted for me!!! It was a tough competition, the other entries were pretty terrific weren’t they?! 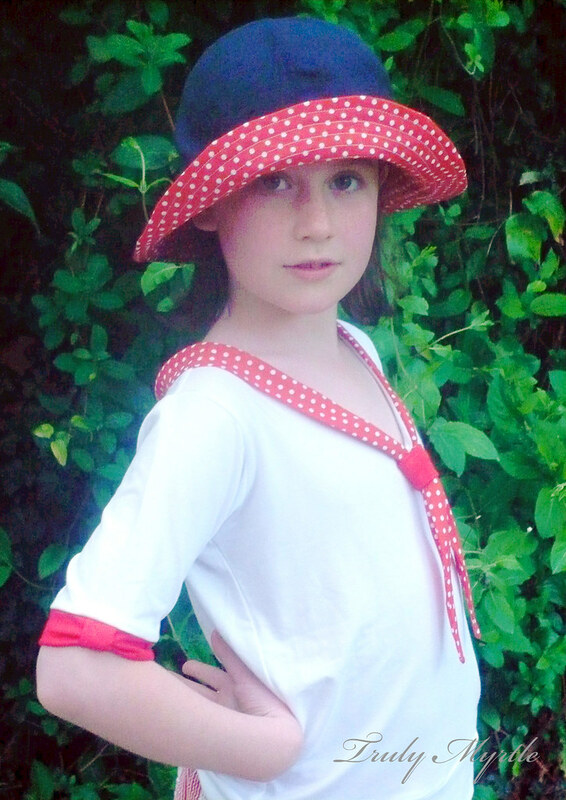 Heidi stole the show with her vintage inspired outfits for her two kids (how many items??!!!) and she leapt into first place almost from the off. I was so excited to make it to the finals from nearly 200 entries (as was Gabriel!) and then amazed to get so many votes! Over 110 when I last checked! It was fantastic fun!!! If you fancy having a go yourself, the next project run and play is auditioning for designers in early march and the competition kicks off in April. I can highly recommend it for a bit of heart-racing action!!! Meanwhile, here at truly myrtle we haven’t been sitting idly watching the votes creep in (well, not too much). After all that madly frantic sewing for Gabe (and a bit more sewing for presents which I’ll show you when they are totally finished) I have been itching to start some new knitting. Do you start new things, when you haven't finished something else? I sure do. Lots of projects on the burner. With Nelly’s surplice (Leslie kindly told me the correct spelling…thanks!) nearly in the bag I looked around for something else to knit. And, I thought, socks. I was inspired actually. For a while now I have been following Kiwiyarns Knits, a great blog by a Kiwi passionate about knitting, especially with beautiful New Zealand wool. Lately, she’s been knitting socks and it inspired me to do some too. I hunted through my basket of sock wool (I know…. a whole jolly basket – I don’t dare show you my stash, or as Mr Myrtle calls it, my art installation) and this blue called to me. Isn't it just a fab colour? It is a Cygnet four ply called denim mix. Anyway, it called and it said “Susannah”. This is how they are going to look and they are so fun to knit. Twisty ribbing and lacey holes. I just love these socks, so feminine and also so sensibly warm at the same time. 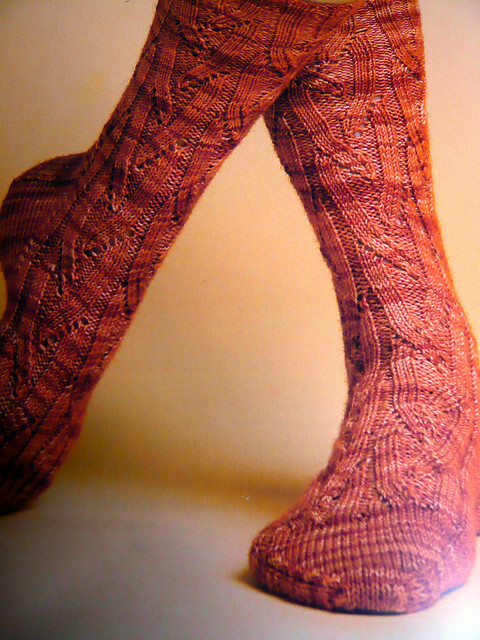 The pattern is called Angee and it's a Cookie A. design from her fab book Sock Innovation. I could wax lyrical about this book, this book is special. Not only does it contain a pile of great patterns in the back, but the front half is a guide to knitting socks and walks you through the designing process. One day, when I don’t have to negotiate a toddler on my lap and constant interruptions, I am going to design some cool socks. This book will tell me how. P.S. If you can't see the Ravelry links I put in sign up as a member here. It's free!